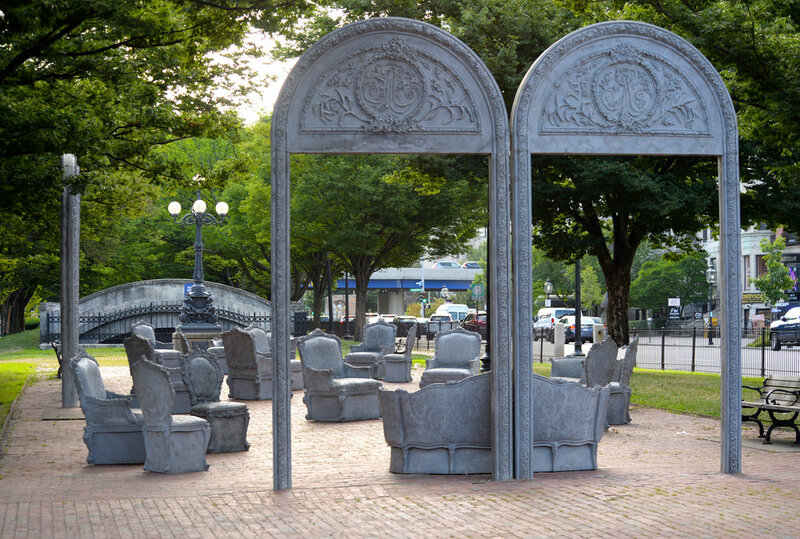 Open House, an installation created by Los Angeles-based, Boston-born artist Liz Glynn, is organized for the Commonwealth Avenue Mall by Now + There. Originally commissioned by the Public Art Fund in cooperation with the artist and Paula Cooper Gallery, Open House was first presented at Doris C. Freedman Plaza in Central Park, New York. This new installment of Open House transforms the Commonwealth Avenue Mall, Kenmore Square into an open air ruin of a ballroom. In this contemporary re-imagining of a historically exclusive space, Glynn addresses the evolving face of a city: who has access to space in a society that is increasingly divided along socio-economic lines? And how can we use history to shape a different future? Glynn’s lavish Louis XIV sofas, chairs, and footstools evoke these extravagant late nineteenth century interiors, but with a twist — these objects feature sculpted additions and are cast in concrete, a utilitarian material more commonly seen in modern architecture. With this revision, the artist invites the public to enjoy a previously exclusive interior space that is now open and accessible to all. Open House is located on the Commonwealth Avenue Mall, Kenmore square. The closest park entrances to the installation are across from 490 and 499 Commonwealth Avenue. Click the Map For Directions. 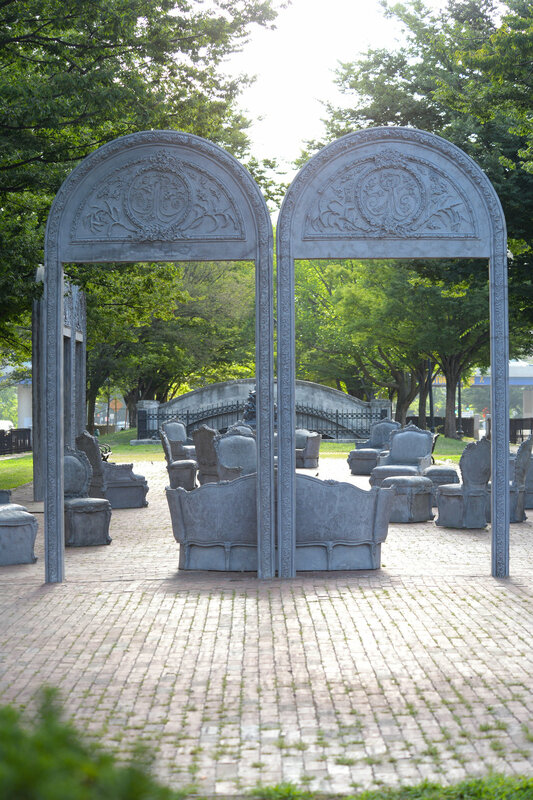 Boston Sun "Braintree Native Creates Gilded Age, Concrete Furniture to Spark Conversation about Access to Space"
At the turn of the 20th century, New England’s wealthy elite gathered in opulent private salons and ballrooms in Boston to define their social status. These gathering spaces were the seat of power, privilege, and politics in the city. In contrast was a growing movement to create more democratic gathering spaces through the development of public parks. The founding and incorporation of parks like Boston Common (established 1660; park status 1850), and the Commonwealth Avenue Mall (dedicated in 1888 as a promenade for public enjoyment), were milestones in American urban planning, representing an early effort — still on-going today — to grant democratic access to public space. The work highlights historic class distinctions and references the architecture and interior design of New York’s William C. Whitney ballroom, a magnificent, now demolished, interior designed by Gilded Age architect Stanford White, the architect of the Boston Hotel Buckminster and numerous Commonwealth Avenue mansions. This fully-functioning furniture will offer residents and visitors alike a place of respite and reflection while also evoking the history of leisure in Kenmore Square and the often-manipulated wetlands of Charlesgate. Recent projects include Open House, a project of the Public Art Fund in NYC, The Myth of Singularity at LACMA, Los Angeles, RANSOM ROOM, a solo exhibition and durational performance at SculptureCenter, New York; [de-] lusions of Grandeur (Monumentality and Other Myths), a 5-part series of performances exploring monumentality and human ambition at the Los Angeles County Museum of Art. Her work has also been presented at The New Museum, NY; the Barbican Centre, London; MoCA, Los Angeles; the Hammer Museum, Los Angeles; deCordova Sculpture Park, MA; the Petit Palais, Paris; and Künstlerhaus Halle für Kunst & Medien, Graz, Austria. Her work has been featured in The New York Times, New York Magazine, Artforum, Vanity Fair, Vogue, The Los Angeles Times, The New Yorker, W, Interview, Domus, Archaeology Magazine, and frieze. Installation for Open House took place from July 9th through July 26, 2018 on Commonwealth Avenue Mall, Kenmore Square in Boston. The complete installation will be in place through November 4. Photos below from Now + There and Ryan McMahon. Gifts received as of 8.15.18.